“Hound Dog” is most widely known as the song that catapulted a young Memphis truck driver named Elvis Presley to mega-stardom. 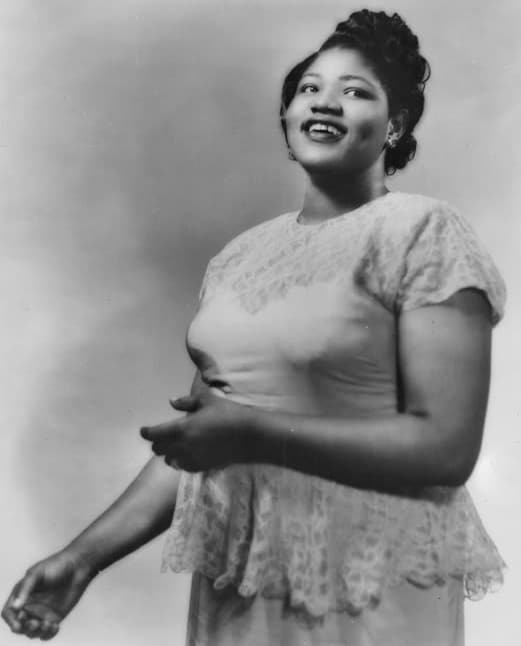 But blues singer Willie Mae “Big Mama” Thornton’s version of the song – the first version recorded by anyone, cut in 1952 – sold somewhere between 750,000 and 2,000,000 copies, depending on who you believe, and ultimately helped launch the careers of several people who would determine the direction of popular music for decades to come. With roots in Gospel music like so many black artists of the era, Thornton was an up-and-comer on the blues scene in the early 1950s when she began to work with bandleader Johnny Otis, who asked L.A. songwriters Jerry Leiber and Mike Stoller – still just teenagers – to write something for the new girl in his band. They came up with “Hound Dog,” a vaguely sexual song about an angry woman’s rejection of a philandering man who had been using her. Purportedly written in less than 15 minutes, Thornton is said to have recorded it with Otis’ band the very next day. After Thornton gave it her own gutbucket, abused-woman treatment over blues guitar backing, it was perhaps a little more intense than what the two white Jewish boys had envisioned, but it was still their song nonetheless. Leiber and Stoller ended up in an authorship dispute with Otis over the song, which they ultimately won. Several years later Presley decided to cut “Hound Dog,” and it’s highly likely that he was familiar with Thornton’s recording, as he was deeply influenced by the “race” music of the South. But he based his version on an almost silly adaptation of the song that he had allegedly heard singer Freddie Bell perform in a Las Vegas lounge. That was the origin of Presley’s line about how the hound dog had “never caught a rabbit,” something that neither Thornton, Leiber, nor Stoller had ever said. Unfortunately, Presley’s version in 1956 became the one that the majority of people are familiar with. Most of us are blissfully unaware that there was originally much more meat to the song, and that the lines You made me feel so blue/Well you made me weep and moan/’Cause you ain’t lookin’ for a woman/All you’re lookin’ is for a home were replaced with the “rabbit” line. But this also actually sort of makes sense, as it would have been hard to change the entire song to fit a male artist’s point of view.